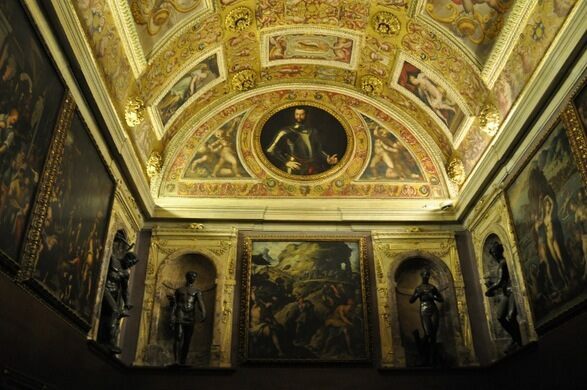 A small room in Palazzo Vecchio in Florence, Italy, the Studiolo Francesco I de’ Medici was the secret refuge and private museum of the one-time Duke of Tuscany from 1574 to 1613. Created between 1569 and 1570 by Giorgio Vasari and some of his scholars, Vincenzo Borghini and Giovanni Batista Adriani, the studiolo is often considered one of the first - and finest - examples of a cabinet of curiosities. None of the objects, though, have been preserved. 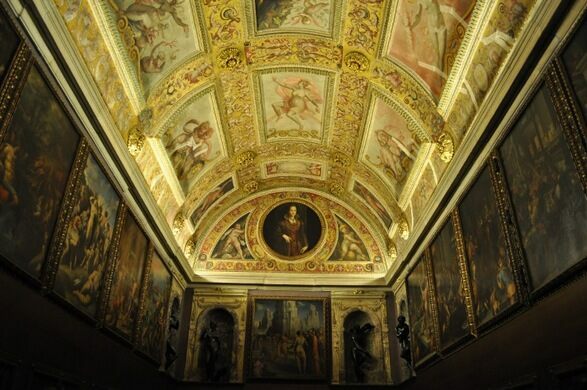 A vault room resembling a jewelry box, the Studiolo Francesco I de’ Medici is where the Duke used to study and collect his rare and precious things he picked up during his travels all over the world. The collection was stored in about 20 cabinets that were distributed along the four walls of the room; each cabinet was illustrated with a panel that, in some way, represented what could be found inside. The chamber is decorated with a complex mix of paintings and sculpture whose principal theme is the relationship between nature and art. 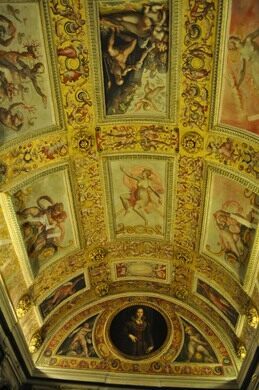 In the center of the Studiolo Francesco I de’ Medici is a fresco of Prometheus receiving jewels from a representation of nature. The themes of the paintings were both religious and mythological, often representing the four elements, the four temperaments, and the four seasons. Each of the room’s four walls had a theme and the objects were classified relating to these themes. For example, Mirabello Cavalori’s “Wool Factory,” which shows the processing of wool in cauldrons boiling over high flames, would have been located on the wall representing fire. A portrait of Francesco I is on a medallion mounted above the studiolo’s entrance, but he’s also featured in one of the larger paintings, Giovanni Stradano’s “The Alchemist’s Studio.” After his death, Francesco’s objects were dispersed and the room dismantled until, in the early 20th century, it was restored and reassembled, even if not exactly how it was originally presented.